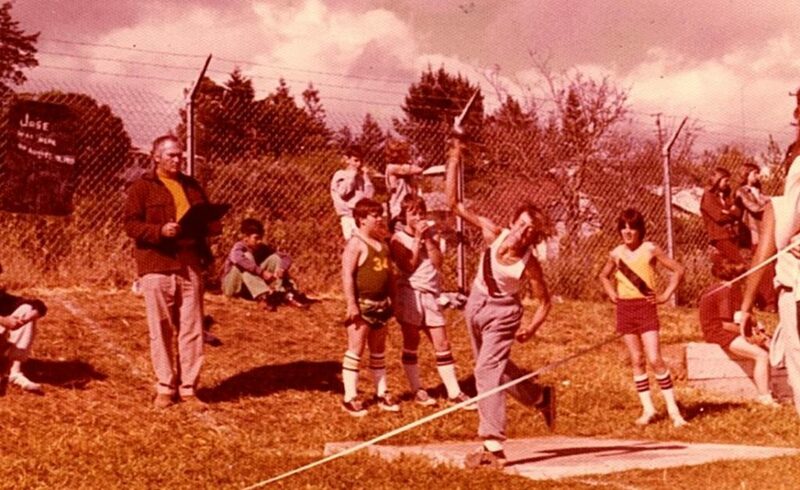 I was a 7th grader at Rincon Valley Junior High in Santa Rosa for the 1972/73 school year. O. J. Simpson became the first running back to rush for 2,000 yards in a pro football season. Watergate scandal and Vietnam War are going on. Atari kicks off the first generation of video games with the release of Pong. Dwayne “The Rock” Johnson and Cameron Diaz are born. I had competed in both little league baseball and youth soccer for years already and was a better than average player. I don’t think I had ever given track any thought. In P.E. classes we all had to do testing for I think the Presidential award. I think it was push-ups, sit-ups, pull-ups, standing long jump, 50 yard dash and the 600 yard run. Anyway there was a history teacher there, John Gash, who was one of the track coaches. He came up with formula’s using those events that would predict what Track & Field events you might be good at. The charts he had said things like if you were good at both pull ups and 50 yard dash you might be a good pole vaulter and if you were good at push-ups and the standing long jump you might be a good shot putter. He then had these letters showing all the Track & Field events on it. It had a line at the top were he would write in your name and then he would circle all the events he said you had the potential to be good at. I think he did one on every single kid in the school no matter how poorly they did but it still showed what event, no mention of how good they would probably do, just what events they would be best at. Now as a dorky naive 7th grader getting a letter from someone saying there were ALL these different events I might be good at was like hearing I was a sure bet to one day win an Olympic gold medal. I don’t think you could have kept me from signing up for track that first spring. We had huge teams of over 100 kids at Rincon, probably because of those letters, and I of course tried every event that was circled on that letter I had received. I have been hooked on the sport ever since, first as an athlete, then a coach and now as a reporter/historian of the sport. I still get excited every spring imagining what the new season will produce all because of a piece of paper with my name on it. 1974 J.H. 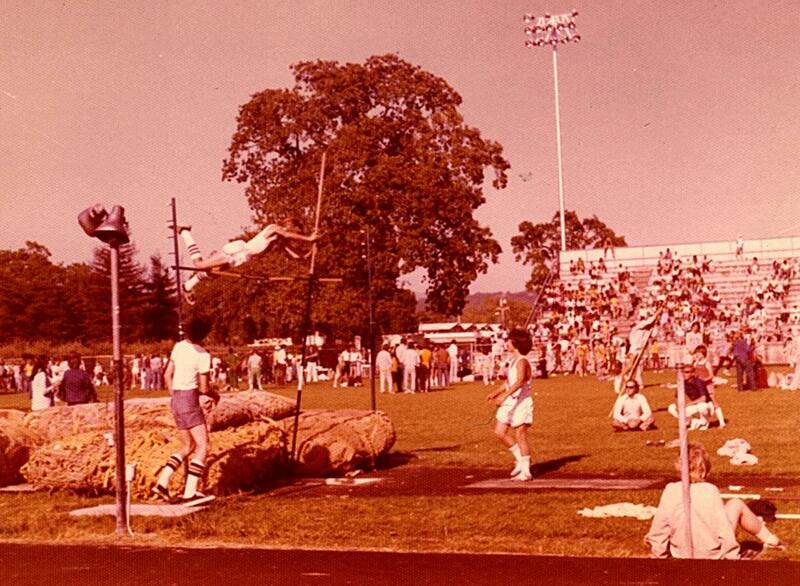 tri-meet at Healdsburg. You can see here in this 8th grade photo how I have now developed into a muscle bound He-Man, ha ha. 1974 J.H. Championships clearing 7-6 in the vault in what might not be legal pits these days.